Sherene Razack, Malinda Smith, and Sunera Thobani, eds. States of Race: Critical Race Feminism for the 21st Century. Between the Lines, 2010. 248 pp. 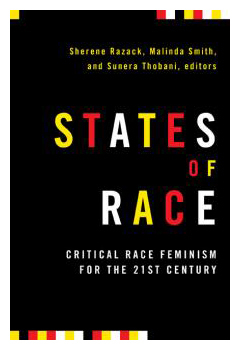 Despite its forwarding-leaning title, States of Race: Critical Race Feminism for the 21st Century is as much about the past as it is about the future. The collection opens by looking backward, with an eight page preface detailing the history of critical race feminism in Canada over the past decade. The contributors to the collection are in a unique position to tell this story; all are members of RACE (Researchers and Academics of Colour for Equity) and many of these authors are responsible for the development and continuation of critical race feminism in Canada. As such, the collection offers an exciting moment of conversation between these influential thinkers as they reflect on the colour line in the 21st century. The preface welcomes readers who are unfamiliar with this history, at the same time as one gets the sense that the book might aspire to take a preemptive strike against those who would deny Canada’s ongoing colonial history and racial hierarchies. History and memory are important themes throughout the collection; the essays continually demonstrate how institutional or state memory purposefully forgets how race underscores the modern liberal subject and the introduction takes aim at mainstream scholars who are equally guilty in “fail[ing] to account for the ways in which race-making is political and a central project of the modern liberal state” (10). As such, the collection stands as an important contribution to the literature of critical race feminism and a reminder of just how much work we in academe have yet to do. The eight essays are divided into two sections with the first focusing on race, gender, and class in the Canadian context. It opens with Patricia Monture’s personal essay, which acts as a second introduction for the entire collection. She notes that her essay is based on a 2001 talk but published here because she “could have written it yesterday” (24). Indeed, what is striking about the collection is that even though the last decade has been marked by claims of so-called “racial progress” (claims Sedef Arat-Koç challenges in a later chapter), many of themes explored remain urgent and unameliorated. As Monture and other contributors to this volume explain, the persistence of familiar debates speaks less about the effectiveness of critical race feminism and more to the intractable nature of structural racial inequalities and the contemporary neoliberal order. Monture also reflects on her lack of “Grandmothers” – racialized feminist mentors in the academy. Her piece, and the collection as a whole, stands in for this continued absence by offering young and old feminists of colour three important strategies of survival in the ivory tower: “knowing yourself, understanding the space (or territory) you are in, and respecting what you have learned from experience as knowledge” (27). Malinda Smith begins her chapter by asking a recurring question: how do we understand equity? In particular, Smith troubles the growing privileging of “women’s issues” as the equity struggle par excellence in academic contexts. Drawing on Sara Ahmed’s distinction between “this Other and other Others” (37), Smith details how equity practices and priorities create a two-tier equity system: [white] women first, and visible minorities, Aboriginal people, and people with disabilities as an undifferentiated second. Taking Monture’s third strategy for survival seriously, Smith grounds her analysis in her own experiences of academic equity planning, a move that not only strengthens the piece but demonstrates the continuing vitality of feminist methodologies. The theme of “other Others” makes an appearance in the next chapter, but on a very different register. Here, Yasmin Jiwani meditates on how the veiled Muslim woman is a floating signifier whose “image can be corralled to fit particular hegemonic designs” (79). Specifically, Jiwani looks at media representations of Muslim women in Canada and Afghanistan. A particularly incisive comparison of The Globe and Mail‘s week-long series, “Behind the Veil: Inside the Lives of Afghan Women” and CBC’s television program Little Mosque on the Prairie form the basis of Jiwani’s analysis. In the former, Jiwani notes that the principal investigator – a white woman – uses her gender as a gesture towards a universal womanhood that simultaneously re-establishes the reporter’s privileged position as a Western woman and casts Afghan women as victims of an ultrapatriarchal society who ultimately need rescuing. This same universalizing tendency holds true for the character Rayyan, a feminist physician on CBC’s popular series. Rayyan is the inverse of the almost-anonymous figures in the Globe report: she is assimilated into “Canadian” culture and her conflicts – with a patriarchal mosque, for example – are presented as quintessentially Canadian. However, Jiwani warns that this universalising tendency erases the differences between Muslims and non-Muslims while upholding the discourse of Muslims as threats and Other. Sherene Razack rounds out the first part of the collection with a different approach to Canada’s Islamic “Other” by focusing on the bureaucratic mechanisms that contribute to state abandonment of racialized subjects. Foregrounding the cases of Suaad Mohammed, Maher Arar, and Omar Khadr, Razack asks whether abandonment reflects racial prejudice, marks a moment of ignorance on behalf of state officials, or signals how people of colour “must be policed and kept at the margins of law and community” (89). Arguing for this last interpretation, Razack draws on interviews with “security delayed” individuals in Canada to paint a horrific picture of families lost in the cracks of a bureaucratic system that is paradoxically “committ[ed] to legal rules that suspend the rule of law in the interest of national security” (103), showcasing a system that treats racialized people as extraterrestrial. Drawing on the work of Agamben and Bauman, Razack concludes that, “race is not only necessary in order for abandonment to occur but also for the state of exception to function” (90). The second section of the collection builds on the themes of the first and discusses race, gender, and class in broader Western contexts. Isabel Altamirano-Jiménez begins with a rousing defence of Indigenous feminism against claims that the two terms are mutually exclusive. Altamirano-Jiménez defines Indigenous feminism in part as a discourse that recognizes sexuality as informing axes of gender difference amongst women. She is careful to acknowledge the very real debates surrounding this issue and pays tribute to the multiplicity of voices and experiences of Indigenous women. She compellingly outlines the necessity of Indigenous feminism while still remaining sympathetic to Indigenous women who are reluctant to claim (if not outright hostile to) feminism. What Indigenous feminism offers is a way to criticize an Indigenous nationality that is often sexist and based on rigid definitions of Indigeneity. An Indigenous feminism rejects this rigidity and Altamirano-Jiménez concludes with a hopeful eye toward the future: “Without seeing them as timeless, fixed, or hermetic, we can bring forward notions of history, knowledge, the local, the colonized, and the Indigenous woman to construct an Indigenous feminism that is expansive, liberating, and committed to decolonization” (122). Thobani reminds us how Western feminism can problematically propagate a notion of white innocence, and she provides yet another salient example of how to criticize a movement without abandoning it all together. One of the themes that separates this book from existing collections focusing on critical race feminism, other than the legacy of 9/11 and related events, is whiteness. In the past twenty years, Whiteness Studies has burgeoned into a rigorous subset of anti-racism studies and its influence is apparent in this volume. While other authors in this collection integrate whiteness in their analyses, Sedef Arat-Koç addresses whiteness directly. In particular, Arat-Koç examines the “destabilization of whiteness along the colour line” (155), arguing that the confluence of class and race creates a racialized poor white subject. The chapter is primarily an update of Annalee Newitz and Matt Wray’s work on “white trash” in the 1990s. Focusing on the post-Soviet era, Arat-Koç begins with a particularly useful reminder of the current racial contradictions in South Africa and America: advancements such as the election of a black US President, the emergence of a burgeoning black middle class in South Africa, or the “browning” (148) of a transnational middle-class more generally hide a growing racial divide, despite claims about “racial progress.” Thinking about “race as a technology of power that goes beyond skin colour” (148), Arat-Koç complicates this contradiction by demonstrating that marginalized whites are both invited in and excluded from whiteness. This push-and-pull – anti-immigration laws and other xenophobic sentiments help bolster a white Western identity while global capitalism pushes marginalized whites down the racial ladder – helps to ensure white participation in the new imperial order. while most critical educators might feel heartened when their students are incited to become actively involved in social justice activism, I prefer to caution my students to be vigilant about what injustices their participation may inadvertently reinforce … [and] show them how real change fails to take place as a result of certain initiatives. This is not to discourage them, but to help them to see with some candour just how hollow many claims to social justice can be. Perhaps most importantly, students need to notice how our involvement with social justice activism obscures our complicity in current power imbalances and allows us to conceive of ourselves as innocent. (183). Mahrouse takes aim at all of us who purport to do social justice activism, within the academy or outside of it, and in so doing summarizes the ethos of the entire book: we must remain vigilant and self-critical about what kinds of effects our attempts at social justice have on the world around us. Despite the collection’s commitment to exploring the intersections of race, gender, state, culture, and colonization, I was surprised to see very little engagement with queerness or sexuality (disability was also a theme conspicuous in its absence). Certainly no collection can attend to everything, but given how closely questions of sexuality are to gender, race and nation the absence is striking. While I would never advocate for a token queer presence, other anti-racist feminism collections (notably Race, Space, and the Law [Between the Lines, 2002]and Scratching the Surface [Women’s Press, 2003]) also suffer from this lack. I cannot help but wonder if this absence reflects the limits of intersectionality in a single volume, or if it is a reminder of the ongoing uneasy relationship between feminist and queer theory. This is, however, my only criticism. The book stands against the growing anti-feminist backlash and the continued plight of Indigenous people and people of colour in Canada and the Western world by offering rich analyses, compelling arguments and, above all, a reminder that the voices of anti-racist feminism in Canada are as strong and vital as ever. Dua, Enakshi and Angela Robertson, eds. Scratching the Surface: Canadian Anti-Racist Feminist Thought. Toronto: Women’s Press, 2003. Print. Razack, Sherene, ed. Race Space, and the Law: Unmapping a White Settler Society. Toronto: Between the Lines, 2002. Print. Ashley Dryburgh studies whiteness, queer culture, and Canadian literature in the Department of English and Film Studies at the University of Alberta.